Turks Cap Lillies often called Martagon lilies, grow well in full sun and partial shade as well as ample shade. However, when grown in full shade, the number of blooms will be reduced. Turks Cap grows from a bulb, typically planted in the fall. The bulb is white, and new plants may sprout from the bulb. The plant contains seed pods with three lobes that are oval in appearance. The nodes include stacks of thin, lightweight seeds that can easily be carried by the wind. Plants can also be grown from these seeds. Turks Cap grows from four to six feet tall. The leaves, some as large as six inches long, grow in whorls on the stem and are lance-shaped. There are usually from three to nine, and they feel somewhat stiff. Other leaves can appear on the upper stem in pairs or alternate. Orange blooms dappled with purple are the most common type, although they can range from white to a deep burgundy. Turks Cap Lily flowers grow above the leaves and are generally from 2.5 to 4 inches wide with six sepals. The blooms and sepals curve and touch the stem forming a “Turk's cap,” thus the name. Plants may have one bloom or as many as twelve. At the base of the flowers, some stamens are a half-inch or longer, and the stamens have anthers that contain pollen, ranging in color from reddish brown to black. Turks Cap blooms do not produce a scent that is noticeable. Certain types of larger butterflies mainly pollinate Turks Cap. Turks Cap often grows in the wild and can be grown from Massachusetts to the southern Gulf Coast. They prefer moist, well-draining soil. Bulbs should be planted from 12 to 24 inches apart and 4 to 6 inches deep. Turks Cap blooms can be seen from early summer to the middle of summer, usually lasting about a month. Turks Cap Lily is a showy flower, also known as Turks Cap Lily, Lily Royal, Turban Lily, American Tiger lily, and Swamp Lily, is a sub-species of the true lily, or Lilium, the latter of which is native to both central and some eastern parts of North America. 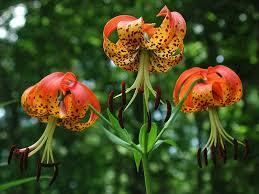 Conversely, the Turks Cap Lily is predominantly found in more specific states, as it is a dwindling genus. This would include some parts of Florida, New Hampshire, Arkansas, Missouri, and more north in Alberta. This sub-species of lily is best known for its considerably vibrant colors and the fact that its petals naturally curl behind themselves, creating a sort of crowned appearance, which would explain its name of "Turks Cap" as it resembles a type of hat worn by the early Turkish. Turks Cap Lily vibrant color can range from fiery oranges to brighter orange-yellows and may even possess reddish tips to its petals. One way it is distinguished from the similarly appearing "tiger lilies," which are of Asiatic origin, would be through the green star at its center, which is a trait that the Asiatic "tiger lilies" do not possess. This genus is also more often than not much taller in size. The nectar provided by the lilum superbum will be sure to attract hummingbirds and other nectar consuming critters, particularly around July, which is the month in which this flower is known to bloom most regularly. They thrive best in soil that is kept consistently moist and often does its best in natural wetlands that are not in an area that it would quickly dry out. They very promptly find places to spread in the wild and create a sharp contrast to the greenery of most gardens, due to their yellow, orange, and red color set. They are also often spotted, though the number of spots will vary.